This article about The Big Picture appeared in The Guardian announcing the film’s premiere in the UK this month. At 10, Dylan Redford, grandson of Robert, could barely read or write. His story features in a revealing and touching documentary about the condition made by his father, James. Robert, James and Dylan Redford Redford attend the New York premiere of The Big Picture: Rethinking Dyslexia. On the face of it, Dylan Redford has everything going for him – he is a handsome, intelligent and artistic 22-year-old who happens to be the grandson of Robert Redford. But he is also severely dyslexic and, at the age of 10, could barely read or write. Dylan’s experiences with dyslexia are depicted in a new documentary,The Big Picture, directed by Dylan’s father, James. 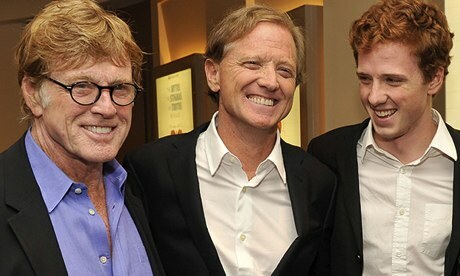 After watching his “intellectually curious” son struggle with dyslexia throughout much of his childhood, James Redford, the eldest surviving child of Robert, says his ambition was simple. He wanted “to make the movie I wish my family could have seen”. The Big Picture, which is released in the UK later this month after garnering critical acclaim in the US, follows the stories of several dyslexics of different ages, including Dylan, and examines how people with the condition cope from a young age right through to adulthood. Among the interviewees are successful lawyers, bankers and chief executives. Sir Richard Branson, the founder of the Virgin Group, talks candidly on camera about his own dyslexia, admitting that someone once had to explain to him the difference between “gross” and “net” profit after a board meeting. Dyslexia is a persistent condition consisting of a combination of abilities and difficulties that can affect the learning process in reading, spelling and writing. According to the Dyslexia Research Trust, 10% of children from all social groups have dyslexia – that represents approximately 750,000 in the UK – and it is the most common cause of childhood loss of confidence, sometimes leading to frustration, depression and even suicide. Yet the condition is still shrouded in mystery. When Dylan was a child, his parents “felt under fire all the time with misinformation”. They encountered teachers who did not know how to deal with their son and people who assumed it was a “made-up” illness that children could grow out of. The Big Picture explores some of the recent scientific research around dyslexia which has used brain imaging to demonstrate that shrinkage in the arcuate fasciculus, the part of the brain that processes word sounds and language, could be one of the condition’s contributory factors. Once Dylan was officially diagnosed, he started to thrive and won a place to study at Middlebury College, a prestigious liberal arts university in Vermont. Redford says that his son, like many dyslexics, is “a big-picture thinker” who can come up with creative solutions to problems but that mainstream schooling in the US and the UK fails to recognise this. Redford, who started out as a writer and producer but moved into directing in 2003 with his feature film, Spin, starring Stanley Tucci, says that his father has seen The Big Picture “many times”. In fact, the documentary was part of the official selection in 2012 for the Sundance film festival, which Robert Redford founded. The selection process is anonymous, so the film was chosen on merit alone. He credits his father with teaching him about film and inspiring him to make a career of it. Growing up in New York with his parents – his mother is the environmental activist Lola Van Wagenen – and two siblings, there was “not a lot of popular culture, not a lot of TV” at home. Instead, his father installed a 16mm projector and screen in the living room and would show classic movies, directed by John Ford, Frank Capra and Stanley Donen. The Big Picture: Rethinking Dyslexia, directed by James Redford, celebrates its UK premiere on 17 October at the Prince Charles Cinema, Leicester Square, London, with a special Q&A.